In reality they propose to develop on highly protected sites, including green areas that have never been “allocated for development”. Other areas, such as the orchard, were allocated in a 1992 development brief, but later officially rejected. In the current Edinburgh City Local Plan, there is no allocation of development for the area. Instead, there is just a series of designations to protect the site. So, when the developers say “previously allocated for development”, they mean previously allocated, and then the allocation was removed. 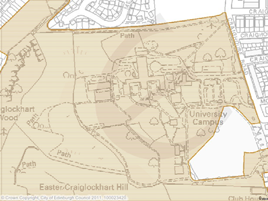 The site is entirely within the Craiglockhart Conservation Area, which was created in 1997 (5 years after the 1992 development brief referred to by the developers). You can obtain a document describing the conservation area and the extra protections on it here. To the right is a map of the conservation area and listed buildings. 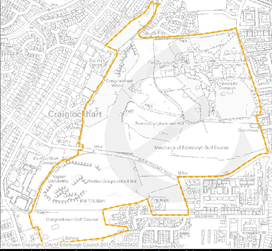 You can clearly see that the entire area of the developers proposals is covered by the conservation area. 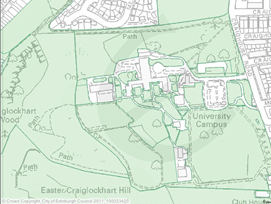 The Craiglockhart Hills Conservation Area is, primarily, an area of open space, in which the Craiglockhart Hills form a significant city feature. A variety of designations protect the open spaces from development. •A significant area of public or private open space: no development to be allowed. • An Area of Great Landscape Value: protection and enhancement of landscape quality. • An Urban Wildlife Site and proposed Local Nature Reserve. • There will be careful control over all development in the conservation area and the surrounding area to protect the character. Permitted development will also be carefully controlled. • All development proposals will be considered for their impact on the natural heritage value of the area. Plans will be prepared to protect and enhance these sites. • Listed buildings and ancient monuments will be protected, as will their setting and surroundings. • Special controls will be exercised over new development in areas designated as residential. Any alterations or new development will be carefully considered and will not be accepted if likely to lead to a loss of amenity or a damaging affect on the quality of the area. So, very clear, plans “will not be accepted if likely to lead to a loss of amenity” (which includes public access and use of the open space). The settings and surroundings of the historic buildings will be protected. In Scotland, conservation areas can also have extra protections, called “article 4 notices”. 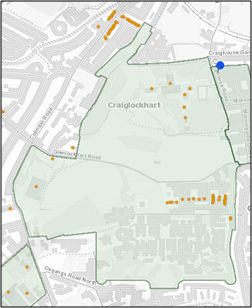 The Craiglockhart conservation area has 9 such notices applied. Any development of this type requires planning permission, even if the rules would normally say otherwise. There is an interactive map of Edinburgh and the planning protections on the council website, but we found it very difficult to use. This shows the area designated as a local nature conservation site. Notice how this includes the car-park, but doesn’t include some of the open space. This is the area designated as local nature reserve. Notice that this doesn’t cover the area that the developers want to build on, and it is so protected the developers want to give it to the nature trail group. This document can be downloaded from Edinburgh Council’s site. It describes Edinburgh Council’s policies on managing listed buildings and conservation areas in the planning process. 5.1 It is the character or historic interest of an area created by individual buildings and open spaces and their relationship with each other that conservation areas seek to preserve. 8.1 The criteria for alteration work apply equally to additions. Careful regard should also be given to the following aspects when considering the construction of new additions. Buildings whose external form and elevations have been carefully designed, or whose settings are particularly sensitive, may not be capable of being extended in an architecturally satisfactory way. Development should retain significant gaps or open spaces which contribute to the street scene or provide the setting for buildings of architectural or historic importance. It’s not clear to us that the site is significantly covered by the “Viewcones” study the Council performed. But the site is prominent in views from many of Edinburgh’s 7 hills, and views from the site are also protected. So, the issue of impact on views of Edinburgh’s skyline is likely to be a major material planning consideration. The Craighouse Partnership’s consultation documents suggest that parts of the site are subject to planning consents. The large arts development planning application is a bit mysterious. We finally (after several attempts) got the planning documentation out of the council planning department’s historical records. The documents include the recommendation from the planning officials to grant the application, although the contract seems to have been signed 5 years later, by which time the consents had almost expired. The consents required an extensive travel scheme to minimize the amount of road traffic. Traffic issues are likely to be a major consideration for any residential development at Craighouse, but are so complex they will need an article of their own. Also, the documents state clearly that development of the orchard was “rejected”. 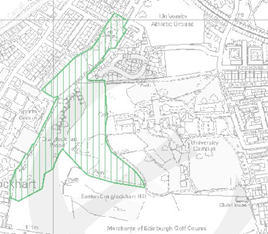 Since then, the new Edinburgh City Local Plan designates the Craighouse Grounds as open space in their entirety (see the maps above). It is still unclear to us what impact this survey has legally on planning, but it does provide an official council view on the Craighouse grounds. It can be downloaded from the council website. Craighouse is signiﬁcant as the site of Old Craig, for the buildings of the Royal Edinburgh Asylum and its associated social history, and for is adaptation to new University uses, but perhaps most of all for its presence in views within Edinburgh and its accessibility to the people of the locality. The 1992 development brief is mentioned repeatedly by the developers. As pointed out above, the brief has since been superseded by the conservation area and the most recent city local plan. What the developers also do not say is that the 1992 development brief stated that the tennis courts should be brought back into public use. Instead, Napier built the car-park on them. Napier also built the Learning Resource Centre on one of the sites identified in the 1992 development brief. And at some point the Meadowspot housing development was built, on land that was previously playing fields for the NHS hospital on the site. The 1992 plan was very clear that just because they suggested sites, it didn’t mean that they should all be built on. What the developers also don’t say is that when Napier got a recommendation to grant planning permission for their arts building, the council planners stated that building on the orchard had been rejected. So, it is abundantly clear that the 1992 development brief cannot be treated as an official allocation for development. Was the Developers’ Claim True? The developers stated that they were only proposing development on areas that are “brownfield or previously allocated for development”. If we accept that the car-park is brownfield, that the orchard and an area of trees across the road from the car-park were allocated in the 1992 brief for development, then that still leaves the area of grass in front of the car-park, the new roads, some of the other 3-4 storey blocks, and the landform, all as areas of proposed development that are neither brown-field, nor previously allocated for development. So the statement the developers made was not just a careful use of words. It was simply not true.